Over a hundred years ago, Rugby Union made it's debut at the 1900 Summer Olympics in Paris. After only being a part of 4 of the first 7 Olympics, the International Olympics Committee (IOC) removed Rugby Union altogether. This summer, rugby hits a milestone as it makes its return to the 2016 Olympics, this time in Seven's. When Rugby was first introduced to the 1900 Olympics there were only 3 participating countries: France, Germany and Great Britain. France won the gold. Germany and Britain both took home silver. Rugby was not included in the 1904 games, but it came back in 1908. After France dropped out, only Australia and Great Britain were left to compete. As predicted, Australia took the gold. For the 1920 Olympics, the USA Olympic committee granted permission for a USA team to enter. The first USA team was comprised of college players from Berkeley, Stanford and Santa Clara. They were one of two teams to compete in the 1920 games. The USA won their first rugby gold after beating France 8-0. In 1924, Rugby Union made it's final appearance at the Olympic games. This time with three teams competing again: USA, Romania and France. 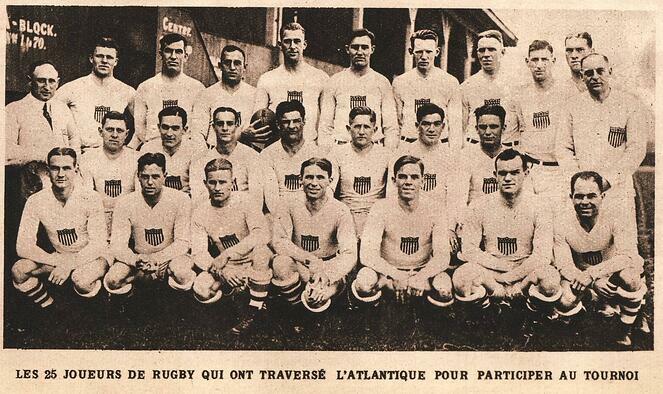 The US defeated France 17 to 3, making them the only country to win two Golds for the sport. At the final whistle of the game, the pitch was invaded by an upset crowd. Following the pitch invasion, the medal ceremony took place with police protection. This was not a good look for rugby's reputation. Combined with the lack of participation and the IOC's desire to include more individual and women's events, Rugby Union was cut from the Olympics. Since the exclusion, rugby is at its peak in popularity. In the last seven years, participation has grown to 7.73 million and female participation has surged to 30 percent from 10 percent. With IRB Chairman Bernard Lapasset and IOC President Jacques Rogge (a former rugby player) making a push, rugby received a yes vote on 9 October 2009 to be included in the Olympics. At Rio, 12 countries will compete to be named the first Rugby 7's gold medalist at the Olympics. America isn't favored to win a medal at the Olympics, but the the men's team came through to win the Sevens World Series tournament last spring. They finished the season in sixth place, after ranking 13th the year before. Being an American company, we will forever root for the USA. However, the best teams in the world come from Fiji, South Africa, New Zealand and Australia. In today's game, the USA lost their first pool match against Argentina. They will play their next match against Brazil at 5pm. It's still early in the games to make predictions, but France, Great Britain, South Africa, Fiji, Argentina and Japan are leading their pools. The women have already wrapped up their journey at the Olympics. The Aussies took home the gold after defeating New Zealand, 24-17. Canada claimed the bronze after a 33-10 win over Great Britain. The USA came in 5th place after their win against France. What Makes Your Mouthguard NOCSAE Compliant?